Do You Write Books in a Series? You Need a Series Page! Do you write books in a series? Do your readers know that your book is part of a series? They want to know. They need to know. And, they need to have an easy way to access the other connected books. 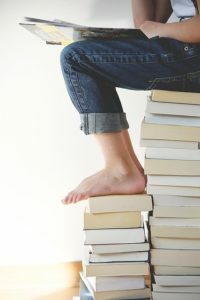 Nowadays, there’s such a thing as a “whale reader.” Whale readers gorge themselves on books, and they tend to prefer books that are in a series because, like everyone, their time is valuable, and they want to invest that time wisely. What could be wiser than investing time in a character they will be able to continue to read about? So it makes sense for writers to be wise as well, and attract whale readers by letting them know you have a series. But how can you do that? When publishing on Amazon’s platform, you’re given a wonderful opportunity to have your own series page, and it’s very easy take advantage of. Here’s what you have to do. When publishing with KDP, you’ll be asked whether your book is part of a series, and you’ll be prompted for the volume number. Please note that the field says this is optional. If your books are indeed linked in a series, consider filling in this information to be mandatory. And, if you’re like me and turn a novel into book one of a series after publishing, make sure you go back and fill in the information afterwards. Now comes the cool part. 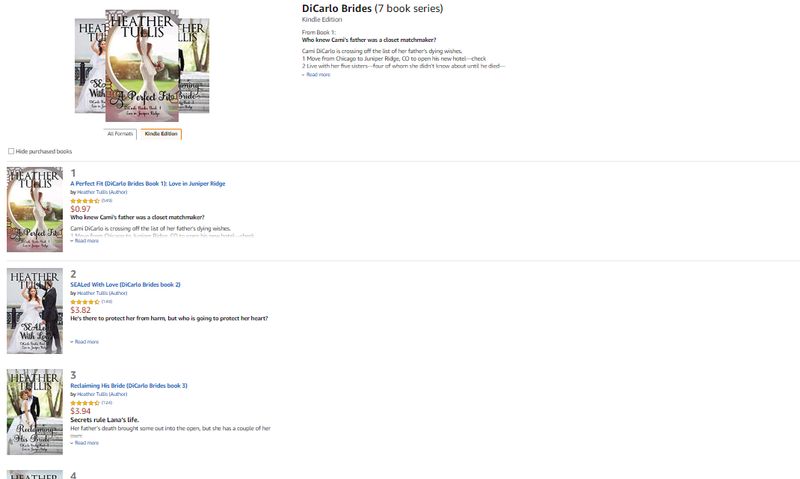 Once your book goes live, you’ll receive a graphic on your book’s product page just below the book cover. It’ll look like this. The above image is an abbreviated graphic. If you have seven books, then all seven will show on the page. Isn’t that the coolest thing? So now, go to all of your books that are in a series and make sure you have them connected to a series page. Bear in mind that you will need to “republish” if you’re editing the information for an existing book, and this could take your title off the market for approximately 12 hours. The potential exposure definitely makes it worth taking the time to do this. If you publish on Smashwords, they also have what they refer to as a “Series Manager.” You can read our tutorial for that here. That was written in 2013 – please let us know if anything’s changed. Now go forth and get your books into a series page so whale readers can find them. Good advice as usual, Martin. I sort of knew about this. Thanks for clearing it up. Thanks, Gordon, glad to help. Yes, a series page is a must to collect all your books in one place. One caution: enter your series title EXACTLY the same way on all your books. I started my series title with the article A and when I forgot that on one book, it wasn’t associated with the others. I had to go back and fix the series name to get that book to appear on my series page. Yes, good advice, Melissa. I’ve seen when that hasn’t been done and it sure can be confusing. Something I need to check into. My titles clearly state “Book 1” etc., but this would make it clearer. I know Smashwords asks the question as well. Yes, it’s nice to have them all in one place. I need to check on this. Will KDP go back and include Createspace titles within the series, prior to KDP taking over? Barbara, I’m not sure. It’s probably best to check with them. Many of my series books were CreateSpace, and they all migrated over to KDP just fine. Again, just make sure you have the series name and the book number in your book’s info. Just adding that on Amazon, books in a series must be numbered 1, 2, 3 etc. A prequel numbered 0 won’t be included, not will companion books. I’ve had to email KDP to get them to put my books in a series. It didn’t happen automatically & after the email it took them several weeks. Aha, good advice. Thank you, Virginia. I’m glad to hear that they eventually did do it. Thanks for this, Martin. Mine were automatically migrated over but in truth, I didn’t quite understand the significance of the series page. You clarified it perfectly! Next Next post: Which “Alley” Flash Fiction Story Gets Your Vote?